Ever since the emergence of Fascist Italy and Nazi Germany, both sides of the American political spectrum have campaigned vigorously to distance themselves from the likes of Mussolini and Hitler by likening their opposition to those despicable regimes. CBI - China: Day 54 of 154 of the Japanese Invasion of Manchuria. Spain: Day 117 of 985 of the Spanish Civil War. CBI - China: Day 22 of 29 of the 1st Battle of Suiyuan. Spain: Day 482 of 985 of the Spanish Civil War. CBI - China: Day 127 of 2,987 of the 2nd Sino-Japanese War. Day 90 of 106 of the 2nd Battle of Shanghai. Germany: Adolf Hitler gives the Nazi-controlled press the task of preparing the German people for war. Spain: Day 847 of 985 of the Spanish Civil War. CBI - China: Day 492 of 2,987 of the 2nd Sino-Japanese War. Day 30 of 81 of Japan's Operation GUANGDONG. CBI - China: Day 857 of 2,987 of the 2nd Sino-Japanese War. ETO - UK: Day 66 of 258 of the Blitz. East Africa: Day 154 of 537 of Italy's East African campaign in the lands south of Egypt. CBI - China: Day 1,223 of 2,987 of the 2nd Sino-Japanese War. Day 362 of 381 of the Battle of South Guangxi. CBI - Thailand: Day 41 of 221 of the Franco-Thai War (Vichy France vs Thailand). USA: The US Army updates uniform regulations, adding the M-1 steel helmet and Parsons field jacket. 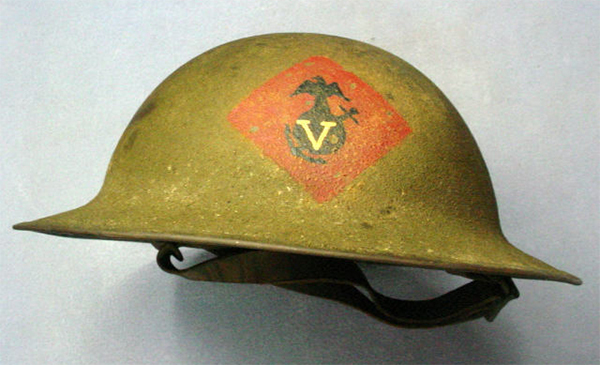 The M-1 helmet was used by the United States military from World War II until 1985, when it was succeeded by the German-looking PASGT (Personnel Armor System for Ground Troops) helmet. For over forty years, the M-1 was standard issue for the US military. The M-1 helmet has become an icon of the American military, with its design inspiring other militaries around the world. Over 22 million US M-1 steel helmets were manufactured by September 1945 at the end of World War II. The Brodie helmet, called "Helmet, steel, Mark I" in Britain and the "M1917 Helmet" in the US, was a steel combat helmet designed and patented in 1915 by Englishman John Leopold Brodie. Colloquially, it was called the shrapnel helmet, Tommy helmet, tin hat, and in the United States the doughboy helmet. It was also known as the dishpan hat, tin pan hat, washbasin, battle bowler (when worn by officers), and the Kelly helmet. The US version, the M1917, was copied from the British Mk 1 steel helmet of 1916. The German Army called it the Salatschüssel (the salad bowl). UK: Churchill's Mansion House Speech: Tells Japan that war on US means war on Britain. The Japanese Foreign Minister says their aim is to make the US and UK retreat from East Asia. Russian Front - Finland: Day 135 of 142 of Operation SILVER FOX, a joint German-Finnish campaign to capture the Russian port of Murmansk in the Arctic. Russian Front - Finland: Day 133 of 140 of Operation ARCTIC FOX, a joint German-Finnish campaign against Soviet Northern Front defenses at Salla, Finland. Russian Front - Finland: Day 142 of 164 of the Battle of Hanko. The Soviets will be forced off their leased naval base. Russian Front: Day 142 of 167 of Germany's Operation BARBAROSSA. Russian Front - North: Day 64 of 872 of the Siege of Leningrad. Russian Front - Center: Day 40 of 98 of the Battle of Moscow. Russian Front - South: Day 12 of 248 of the Siege of Sevastopol, Crimean Peninsula. MTO - Libya: Day 215 of 256 of the Siege of Tobruk. East Africa: Day 519 of 537 of Italy's East African campaign in the lands south of Egypt. CBI - China: Day 1,588 of 2,987 of the 2nd Sino-Japanese War. USA: President Roosevelt announces the breaking-off of diplomatic relations with Vichy France. Russian Front - North: Day 429 of 872 of the Siege of Leningrad. Russian Front - North: Day 190 of 658 of the Siege of the Kholm Pocket, USSR lays siege to the Kholm Pocket but the Germans hold out for a about a year and a half. Russian Front - South: Day 136 of 150 of Germany's CASE BLUE, the failed offensive to take the Caucasus oil fields. Russian Front - South: Day 80 of 165 of the Battle of Stalingrad, bloodiest battle in human history. MTO - Egypt: Day 19 of 20 of the 2nd Battle of El Alamein. MTO - North Africa: Day 3 of 9 of Operation TORCH, the invasion of Morocco and Algeria. The Americans capture Oran, Algeria. Marshal Pétain takes command of all Vichy forces. MTO: US heavy bombers hit harbors at Bengasi, Libya, and at Candia, Crete. CBI - China: Day 1,953 of 2,987 of the 2nd Sino-Japanese War. PTO - Alaska: Day 157 of 435 of the Battle of Kiska, Aleutian Islands. The US and Canada will defeat the Japanese invaders. PTO - Malaya: Day 265 of 357 of the Battle of Timor Island, a long guerrilla war ending in Japanese victory. PTO - New Guinea: Day 113 of 119 of the Battle of the Kokoda Track. The Australians continue pushing back the Japanese troops. PTO - Solomon Islands: Day 96 of 187 of the Battle of Guadalcanal. Russian Front - North: Day 794 of 872 of the Siege of Leningrad. Russian Front - North: Day 555 of 658 of the Siege of the Kholm Pocket. USSR lays siege to the Kholm Pocket but the Germans hold out for a about a year and a half. Russian Front - South: Day 79 of 122 of the Battle of the Lower Dnieper River, USSR. The Soviet Army achieves a breakthrough near Gomel in Byelorussia. Russian Front - South: Day 8 of 10 of the 2nd Battle of Kiev, Ukraine. MTO - Italy: US 12th, 15th and Royal Air Forces provide air support for the Allied ground troops. CBI - China: Day 2,318 of 2,987 of the 2nd Sino-Japanese War. Day 9 of 49 of the Battle of West Changde. PTO - New Guinea: Day 53 of 219 of the Battle of Shaggy Ridge. PTO - New Guinea: Day 50 of 162 of the Battle of the Huon Peninsula. PTO - New Guinea: Day 9 of 10 of the Bombing of Rabaul, a joint US, Australian and New Zealand carrier and land-based attack on the Japanese cruiser force at the naval base at New Britain. PTO - Solomon Islands: Day 10 of 295 of the Battle of the Bougainville Islands. 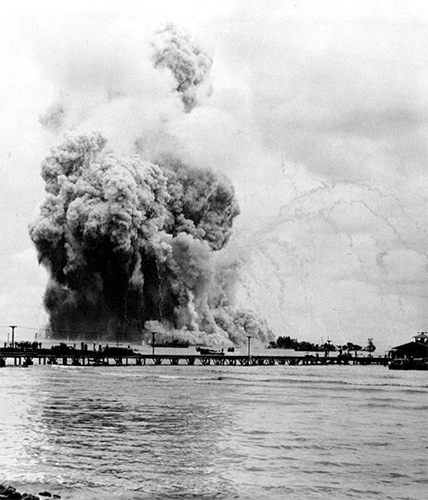 PTO - New Guinea:The ammunition ship USS MOUNT HOOD explodes in Seeadler Harbor at Manus in the Admiralty Islands, killing 432 and wounding 371. 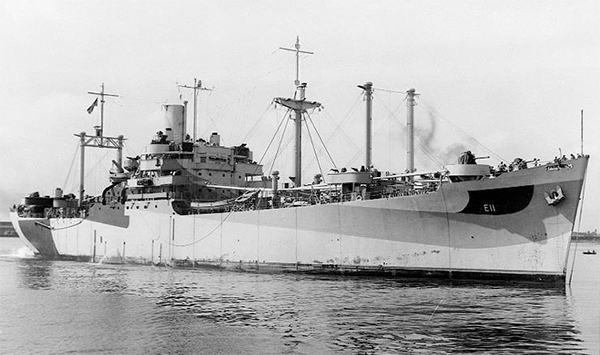 The MOUNT HOOD had been a new ship, commissioned on July 1, 1944. Soon after 18 men who had left the ship for shore had reached the dock, the USS MOUNT HOOD exploded with an estimated 3,800 tons of ordnance material on board, killing all men aboard, obliterating the ship itself, and sinking or severely damaging 22 smaller craft nearby, including the USS MINDANAO, which lay about 300 meters away, which was heavily damaged by the explosion and 180 of her crewmen were killed or injured. A board convened to examine evidence relating to the disaster was unable to ascertain the exact cause. After only a little over four months' service, the USS MOUNT HOOD was struck from the Naval Register on 11 Dec 44. The smoke trails are left by fragments ejected by the explosion. The explosion was not due to enemy action; its cause has never been determined. ETO - France: Day 102 of 284 of the Battle of Brittany. ETO - France: Day 57 of 236 of the Siege of Dunkirk. ETO - Germany: Day 53 of 145 of the Battle of Hürtgen Forest. ETO - Germany: US 8th Air Force sends 752 heavy bombers and 808 fighters to attack airfields in west Germany. Russian Front - Finland: Day 57 of 223 of the Lapland War. Finland and Russia have joined forces to kick the Germans out of Finland's most northern province. Russian Front - Center: Day 27 of 206 of the Battle of the Courland Pocket in Latvia. Russian Front - Center: Day 20 of 99 of the Siege of Memel, a border town of Lithuania and East Prussia. Russian Front - Center: Day 58 of 72 of the Battle into East Prussia and northern Poland. Russian Front - South: Day 13 of 108 of the Battle of Budapest, Hungary. Russian Front - South: Day 58 of 72 of the Battle of Belgrade, Yugoslavia. CBI - Burma: Day 224 of 302 of the Chinese Salween Offensive in Burma. CBI - China: Day 2,684 of 2,987 of the 2nd Sino-Japanese War. Day 208 of 259 of Japan's Operation ICHI-GO. PTO - New Guinea: Day 319 of 597 of the Battle of New Britain. PTO - New Guinea: Day 203 of 481 of the Battle of Western New Guinea. PTO - Palau Islands: Day 57 of 74 of the Battle of Peleliu (Operation STALEMATE II). PTO - Philippines: Day 22 of 299 of the 2nd Battle of the Philippines, aka the Liberation of the Philippines or the Philippines Campaign. PTO - Philippines: Day 22 of 73 of the Battle of Leyte. 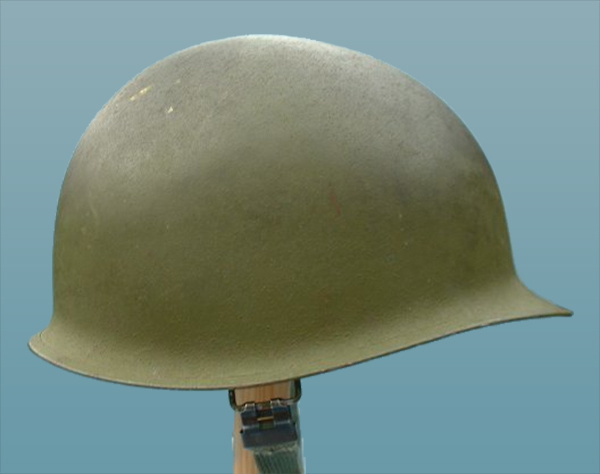 The development and combat use of the US WWII era fixed bail M-1 helmet is covered in this well-balanced and complete work, which includes previously unknown material and unique examples of the M-1 helmet.